True, beneficial transformations are challenging. They require distinct goals, clearly understood methodology, sustained and focused participation, as well as a variety of specific skills and leadership. They generally require additional resources to help implement strategy, process and/or technology successfully without negative impact to the main business engine. 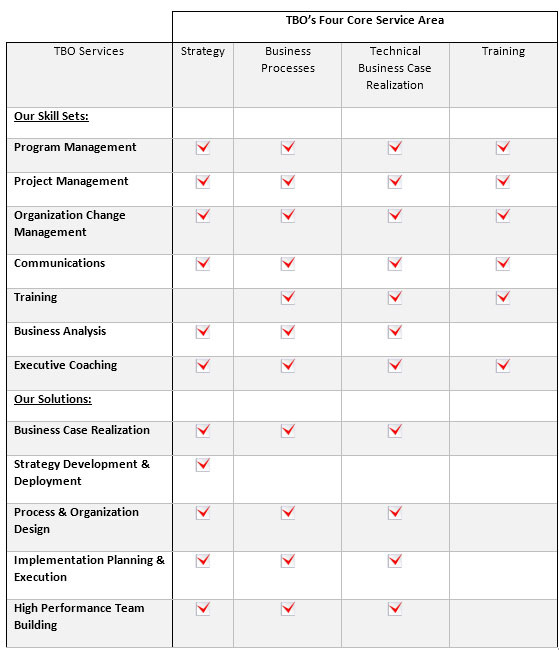 We work with client personnel from top to bottom -- company leaders, project teams, employees -- to translate strategy into systematic, executable actions and ensure that new processes and technologies are fully integrated into the core business and operationalized for positive, consistent business results. Our list of services is focused on, but not restricted to, the following, mapped here to our four core service areas.